Approximately half of our users are running an English (US, British, or other) version of Firefox. This is why localization is such a critical part of Mozilla, because it enables us to reach that other (significant!) half. 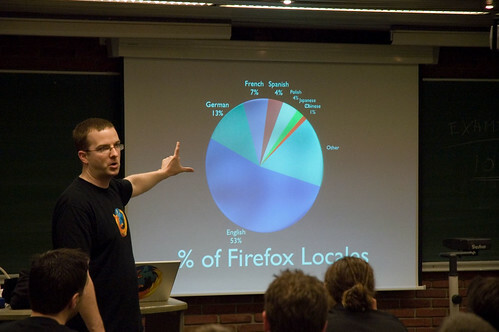 Shrep presenting percentage of Firefox locales. Photo (c) Martin Creutziger. 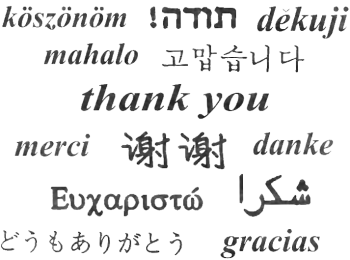 Localizing SUMO is not just about translating English articles to another language — it’s about making the Firefox support experience truly local, while also participating in the mission to further refine the quality of our support. Let’s take an example: a localizer might start translating an English article into her own language, but while doing that she spots an error in the English article that needs to be corrected. By making that correction in the English article herself, or by notifying an English article editor (e.g. by posting feedback at the bottom of the article), the overall quality of our work improves, which of course everyone benefits from. Another example is if the localizer is able to express herself in a clearer way than the original English article reads. In this case she could make sure that improvement is shared with the English half of our users in a similar way as described above. The Knowledge Base is far from perfect — there are lots of opportunities to improve the readability of the articles, and localizers have a great opportunity in this ongoing work by either writing a better localized version (and inform English contributors about the improvements), or by simply updating the English article directly. One aspect of localization in the context of support is that some support topics only really apply to specific locales. For example, a popular German news site (e.g. spiegel.de) might have problems working correctly in Firefox for some reason (highly unlikely, considering the popularity of Firefox in Germany). In this case, a German SUMO contributor could just create a Knowledge Base article for that problem even though it doesn’t yet exist in English. Depending on the nature or severity of the problem, an English article might still be warranted, but the German localizer shouldn’t feel obligated to do that work him/herself. Of course, for people that are comfortable with just translating an English article to their own language, SUMO can help there as well by providing tools that help determine which articles are the most important to translate. By sharing the weekly stats about the most commonly reported problems or requested features with localizers, we should be able to provide a clear overview of which articles to focus on first. It should be easy to see the translation status of a SUMO locale. A localizer should be able to log in and be presented with a dashboard summarizing the overall status of the contents available for his or her locale. We should use things like pie charts, colors, tables, etc to paint a clearer picture to everyone participating. The priorities should be clear — it should be easy for localizers to see which articles should be translate first. If there are some articles that users read more often than others, these articles should be clearly marked as in need of translation. What more can we do to make the localization experience as smooth as possible? Probably a lot of things. We should definitely make sure the UI of the site is fully and easily localizable using established file formats (*.po files anyone? ), and more generally, we should connect with localization teams and individuals to gather more feedback. If you’re a localizer, please help us by providing your feedback; it will really help us verify that we’re on the right track and thus allow us to move forward faster. Thank you in advance! David, We’ve been working on Verbatim, a tool for translating Mozilla stuff like the AMO website. Eventually, we might be able to use if for things like Firefox. Do you think SUMO might be a good candidate for Verbatim when it launches? I know Verbatim is focusing on AMO right now. Maybe we should chat with the Verbatim developers to see if we can set up SUMO as one of the projects available for translation. This tool will allow localizers to do a lot of the stuff you mentioned above: view a dashboard, translate content, prioritize work, and more. Let’s try to find out if Verbatim could be used for SUMO. Seth, definitely! Verbatim looks like a very interesting project and I’d love to explore the possibilities of integrating it with SUMO. It would be great if we could set up a chat with the Verbatim and SUMO developers to get a good overview from both sides of this. Let me know if/when you set up a meeting and we’ll be there! David, We’ve been working on Verbatim, a tool for translating Mozilla stuff like the AMO website. Eventually, we might be able to use if for things like Firefox. Do you think SUMO might be a good candidate for Verbatim when it launches? tSeth, definitely! Verbatim looks like a very interesting project and I’d love to explore the possibilities of integrating it with SUMO. It would be great if we could set up a chat with the Verbatim and SUMO developers to get a good overview from both sides of this. Let me know if/when you set up a meeting and we’ll be there!